Looks good, Pierce! I'd say your starts are right on. their third set of leaves, you are probably good to go. I've been continuing my feeding of diluted bat guano tea, once a week. (Really starting to get RIPE.) I'd like to add a little Cal-Mag to this as well. 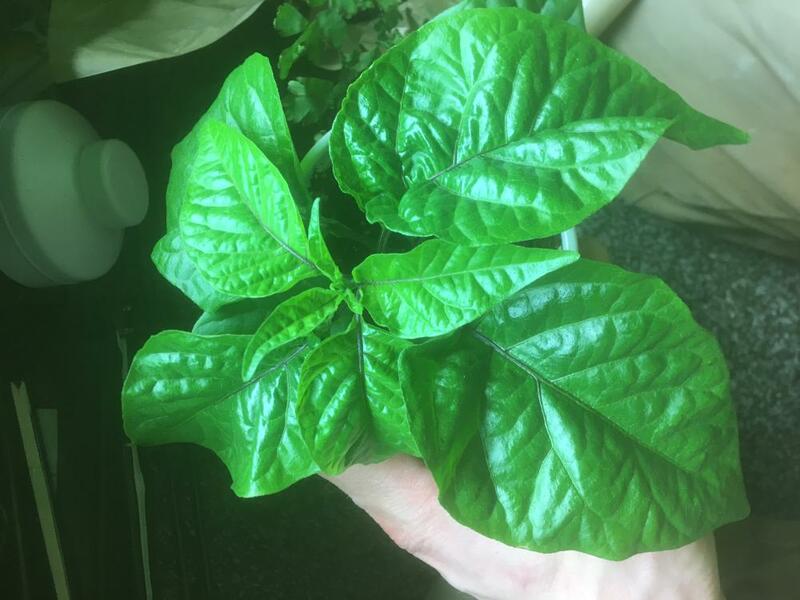 I've got some photos that make me think I have a deficiency, please see those and weigh in if you can. I've raised my light UP, 12" above the tallest seedling. Lighting is 16 ON, 8 OFF. Temps below the lights are 70F-80F. I have a fan (probably too strong to be honest, even on the lowest setting) that I have blowing on the plants while the lights are on. I water 1-2x a week as needed till I get a few small dribbles of water out the bottom of my cups. Here's what I've noticed so far, given my setup. 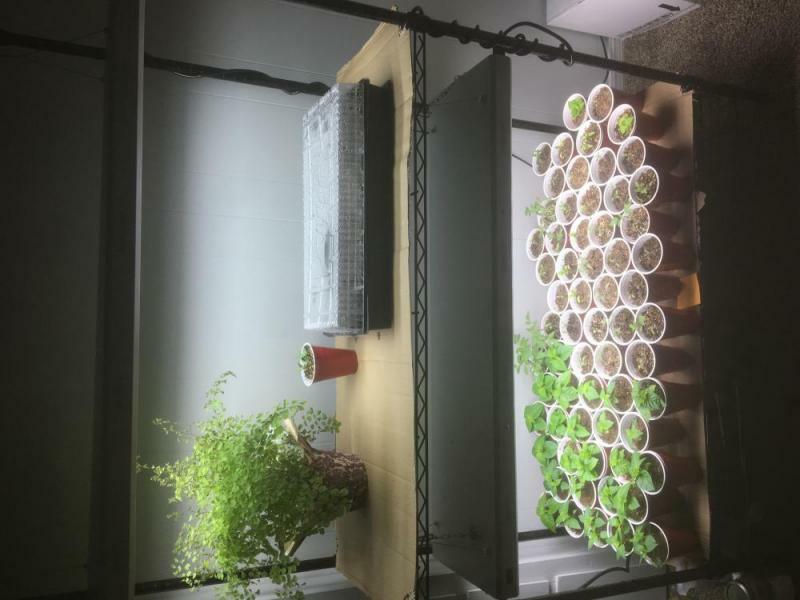 (4 Lamp, 6500K, T5HO, 54W per) The seedlings at the periphery of where my light shines were doing the best. Their growth was on par with everything else, but they looked the healthiest. Seedlings at the CENTER of the lighting footprint seemed to be a little unhappy (yellow leaves, some other weird stuff) so I raised the light. I don't have a way to measure how intense the light at the sides was, so I'm just crossing my fingers and hoping for the best. I've also been seeing some weird things on the leaves. 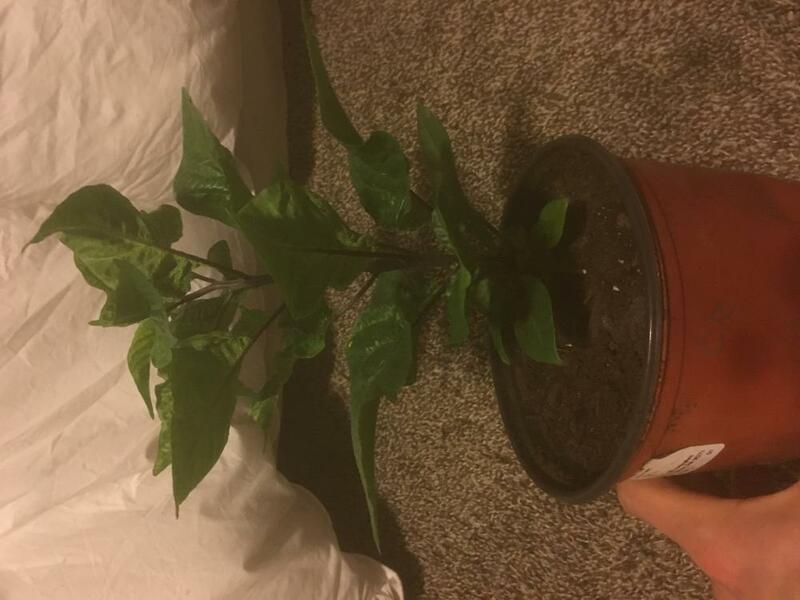 Leaves are looking a bit crinkled (calcium? 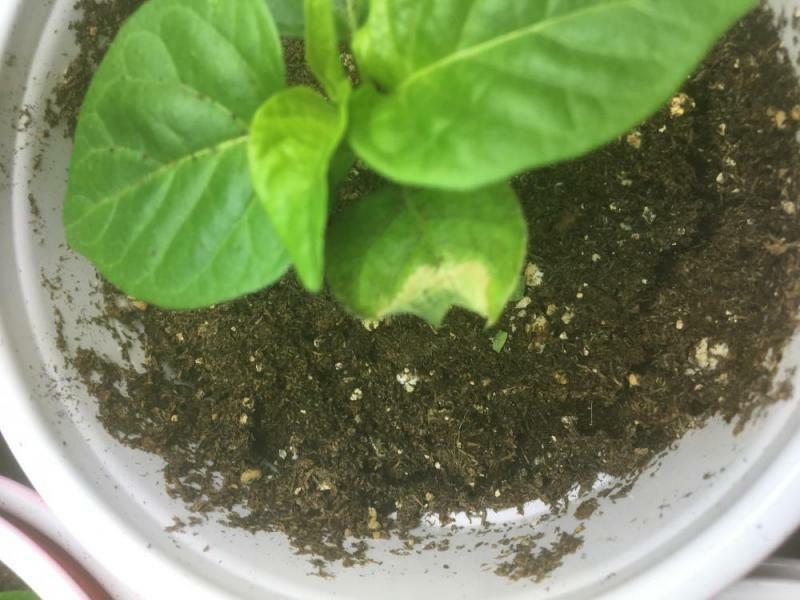 ), and some plants have yellowing/weird patchy areas in the leaves (between the veins). I'm not sure if this would be bleaching by the lights, calcium/mag/IRON deficiency. 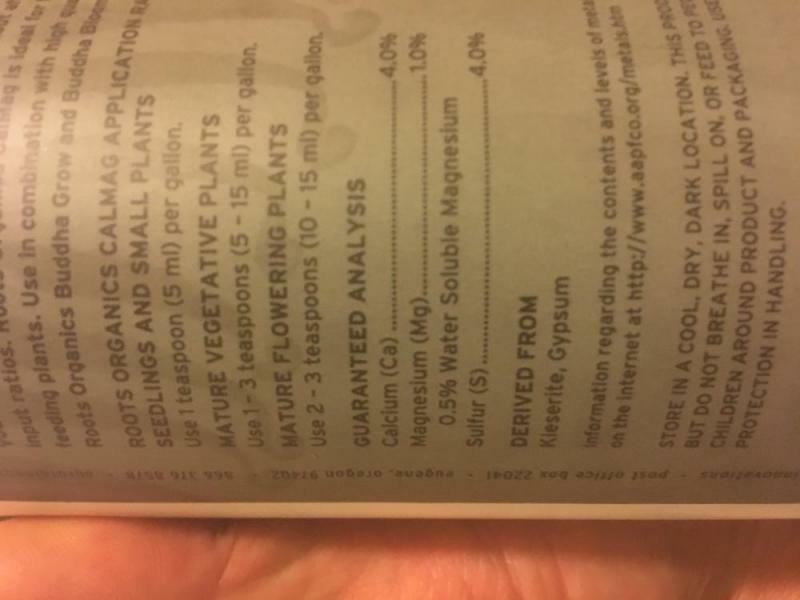 I picked up a CalMag solution at a hydroponics shop, but it does not include iron. Instead it has Sulfur. I'm thinking of bringing it back and getting the one with Iron instead of sulfur. Any thoughts? Let me know what you think. I've used starting mixes that had no added fertilizers in them, so from what I've heard they will need things added to them. 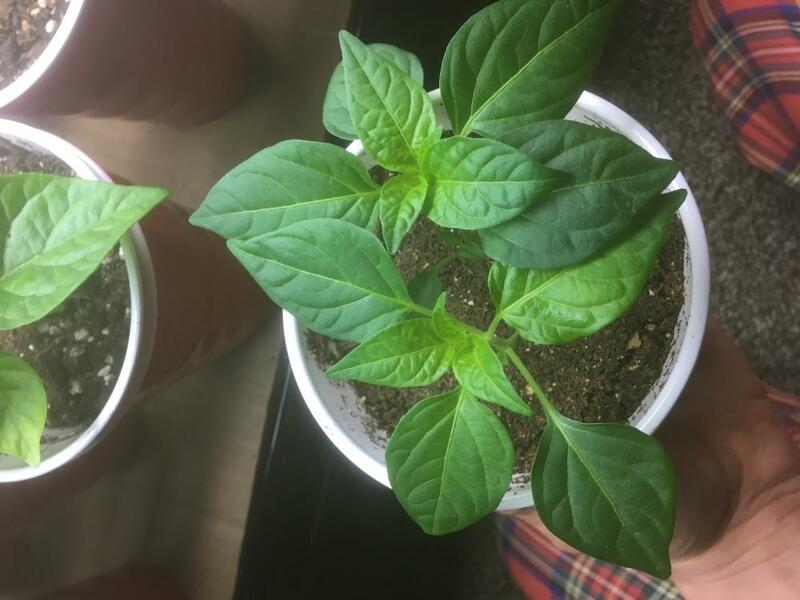 Thai Ornamental's are looking great, Reapers/Douglahs are looking pretty strong (thick stems! 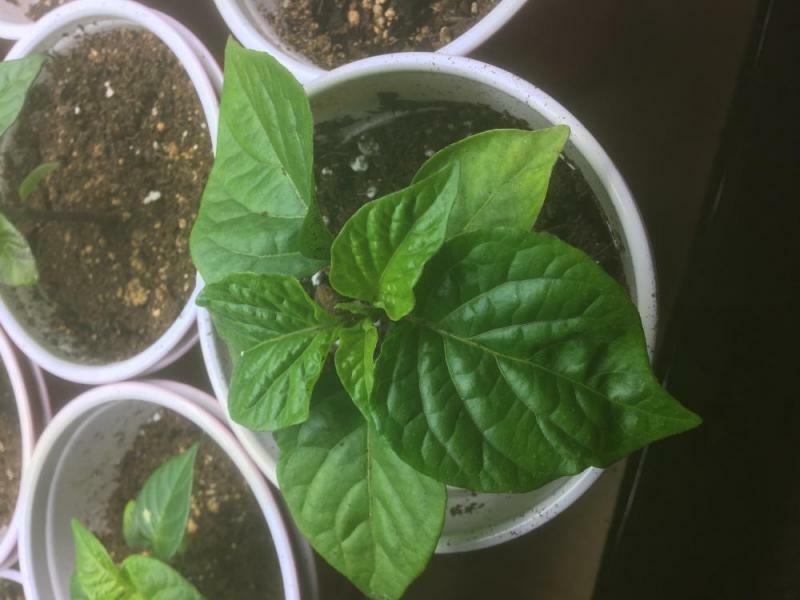 ), I have a 8-10 orange habaneros that are up and one that's REALLY LEGGY. They are under the light now. I think that's about everything. 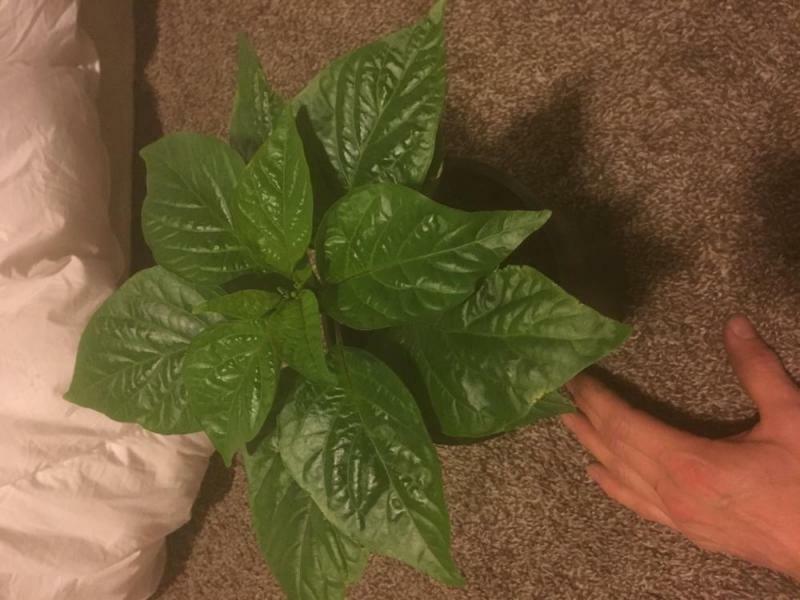 Please weigh in on what you think might be the problem with some of these plants. It's pretty minor and might just be having the light too close. Edited by ThePickler, 09 March 2019 - 08:53 AM. More pics - probably sideways....is there a pixel height at which the boards automatically turn the photos? Honestly, I think your plants look pretty good. Not sure I see anything concerning there. No idea why your pics are sideways. 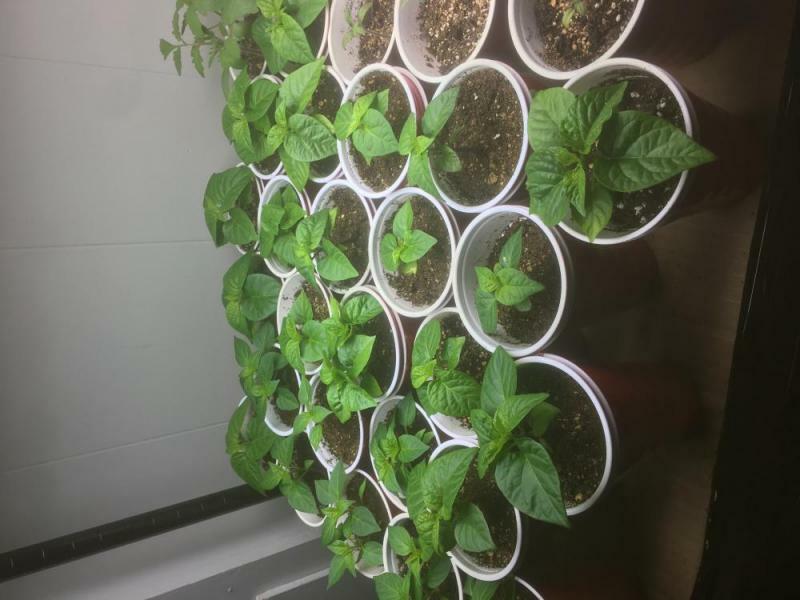 Plants are looking good. I think the sideways photos are generally when using the native photo app on ios. I use a third party app to take photos with my iphone and do not have the problem. When using the native app I edit the photos(usually just crop the ends a little). It seems once edited the pics will post in the correct orientation. It's been a little over a week since my last post. Things are still going pretty good. 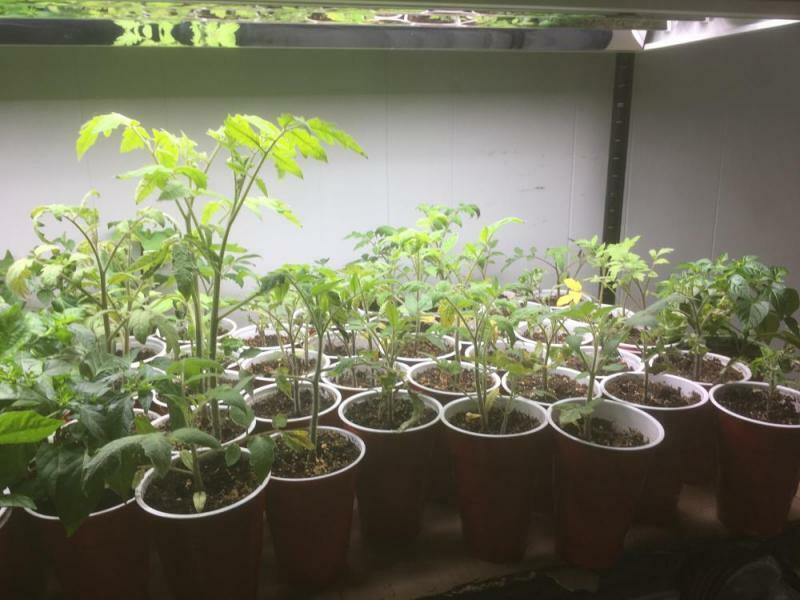 I had some fast and unexpected yellowing of my tomato seedlings, which surprised me. I was trying not to overwater anything, so that may have been the issue. (Let them dry out like peppers, when I know they prefer to have moist soil most of the time.) So, I'm watering those more often. I'm afraid some may have been stunted from separating them while moving them to their own cups. 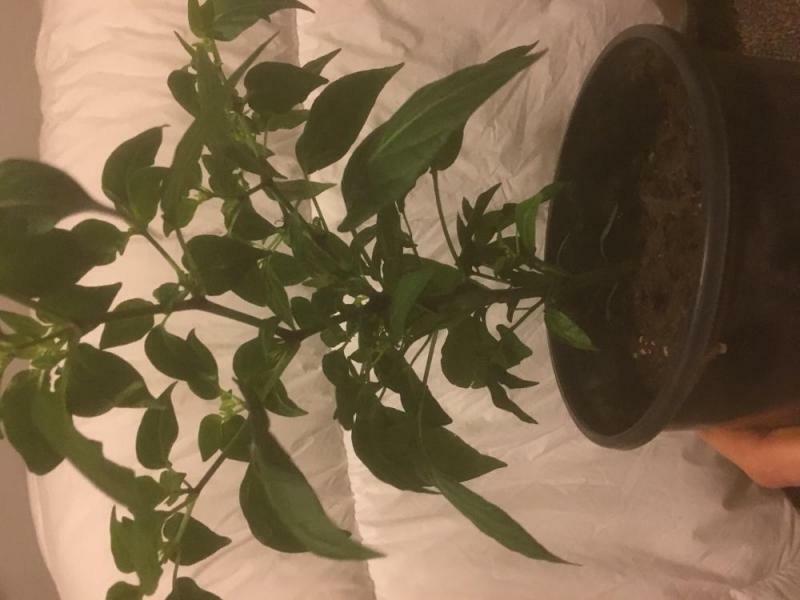 The peppers seem to be doing pretty well. 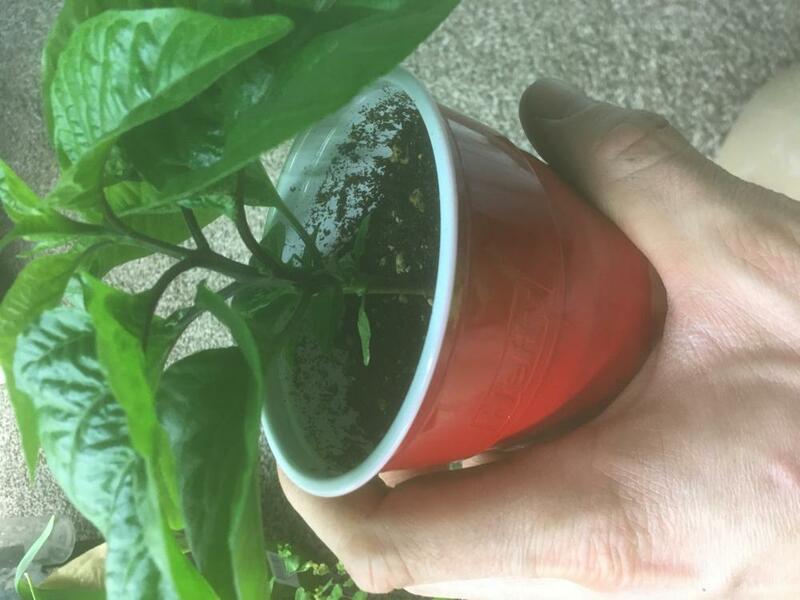 I also had some yellowing there in a few of my Thai chili's. I'm chalking it up to 'too little' nitrogen. I've been waiting for them to get pretty dry/borderline wilted before I water them, so I don't think it's from overwatering. Also, some of the plants look to develop "goosebumps" on their leaves. Anyone ever see this? I've tried to get a photo of it. 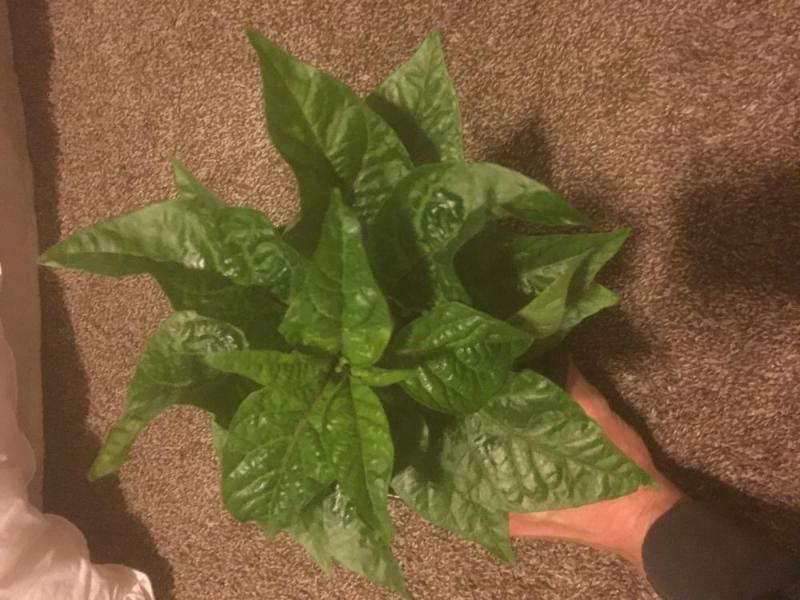 the bottom of the leaves, as well? Plants still looking good overall. I looked up photos of edema on google and that looks like the stuff. 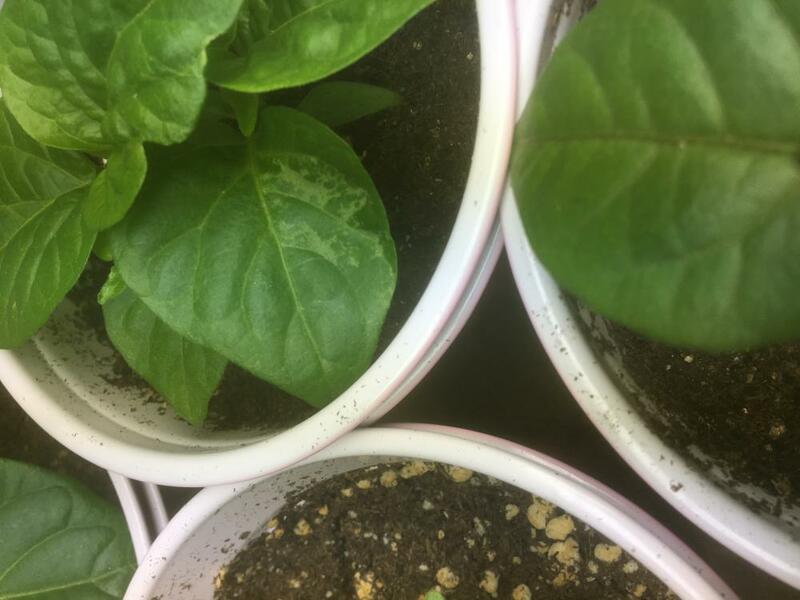 I read up on the causes and will be changing the way my fan blows on the plants and maybe cutting my diluted compost tea additions. Thanks for the reply, any other tips on getting rid of it? It said it was mostly cosmetic but indicative of growing condition problems. I had a case of mass edema and it ended up originating from poor airflow. Now I have a small fan giving everything a good breeze and haven't had nearly as many problems like that. Well, I'm up early today, (weird how that works on weekends...) so I've got a bit of time to update the grow log. 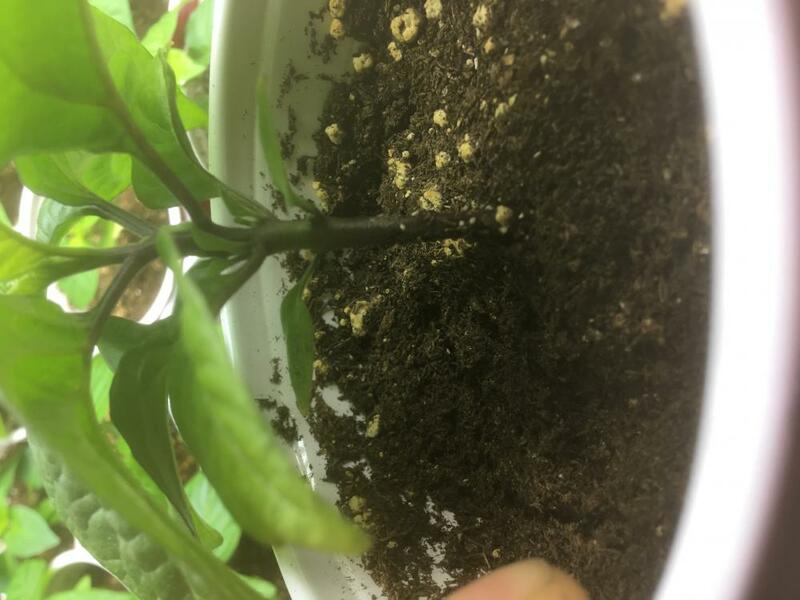 Things are going pretty well with the peppers. Everything is still nice and green (a little yellow here and there on some of the bottom leaves) but lots of new growth all around. 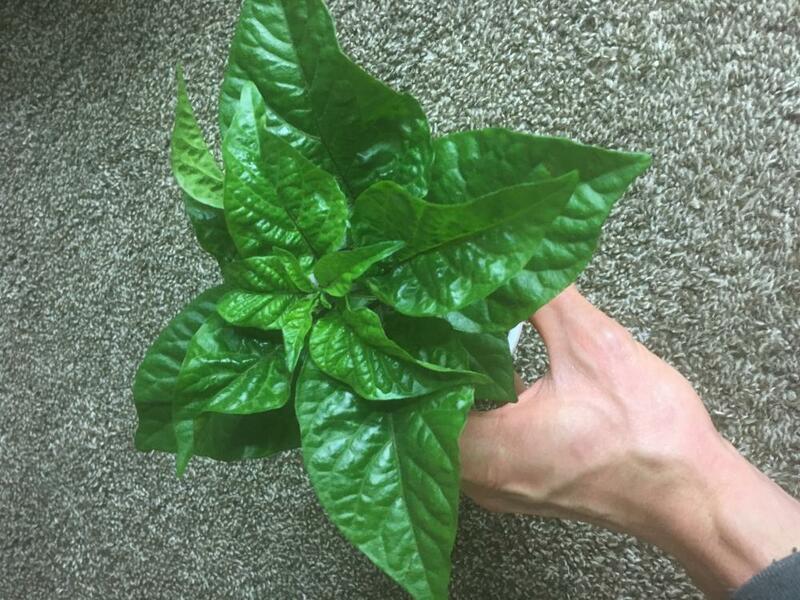 Most of the pepper's leaves are really getting big. 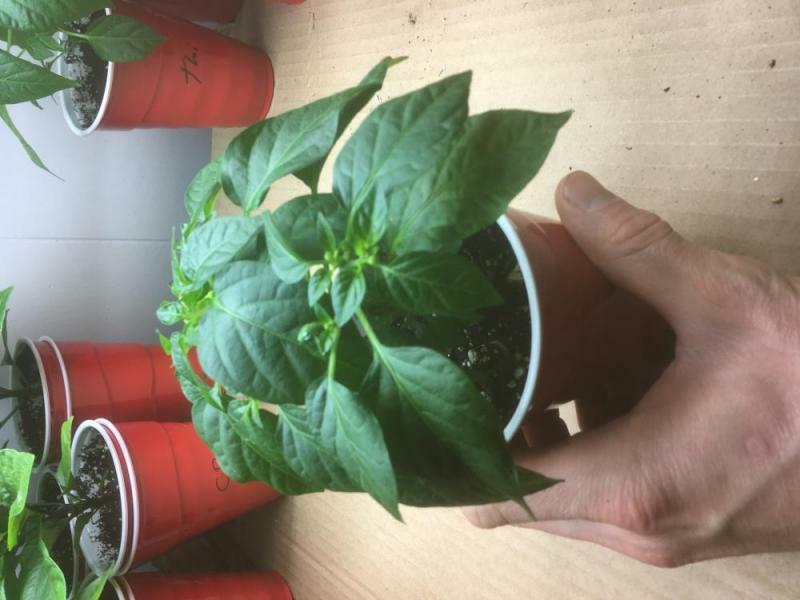 The Butch T Scorpion has really bounced back after its slow start and all of the Reapers and 7 Pots are looking good. Habaneros are playing catch up, the same with the Trinidad Bean and Cherries. 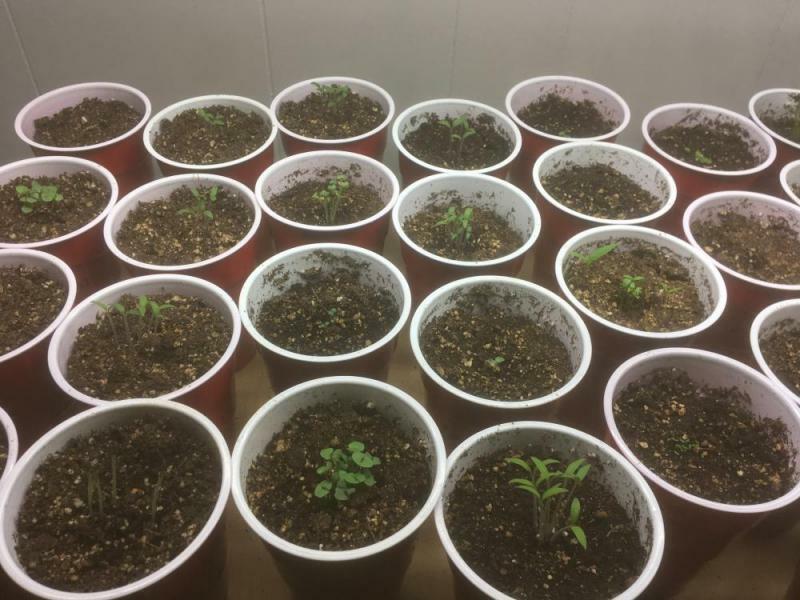 Tomatoes: I'm learning again that they are a lot more sensitive to watering than the peppers. I'll probably take some of them out that didn't take their transplants well. So here's a few questions: It's still, AT A MINIMUM, a month and a half before being able to plant out. I was wondering if I should move the peppers to larger pots or if the solo cups would still be ok. 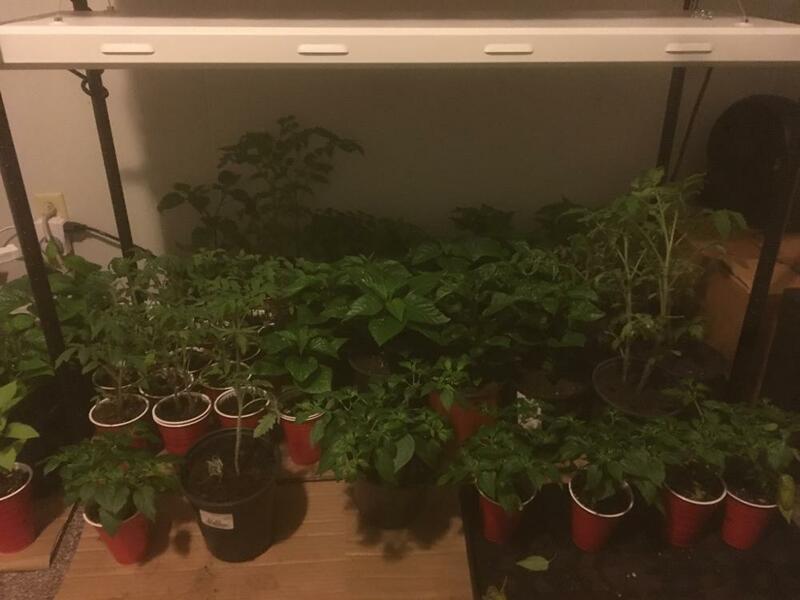 I'm not sure how adding larger pots to our growing area would work out for us. Will it stunt their growth or just slow them down? Root binding? I also looked at topping the plants. Is it true that it reduces the amount of time to fruiting? 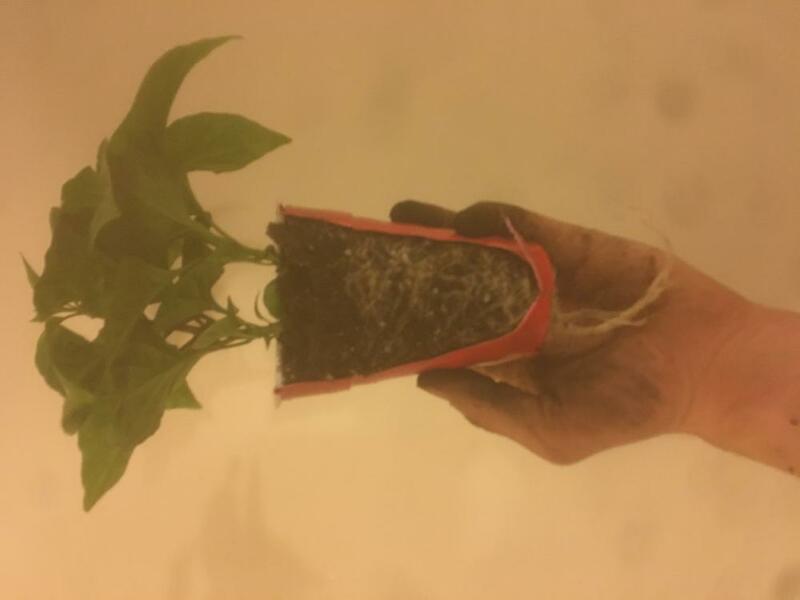 Does it reduce the average number of peppers produced? We'll be planted out by the end of May, but probably have frost by October. 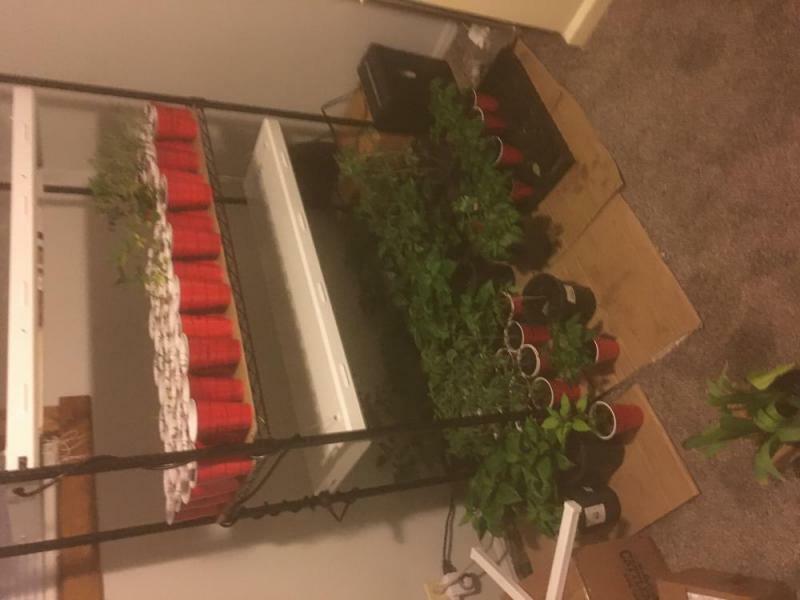 Pictures are: Misc herbs, Reaper, Reaper, grow rack. 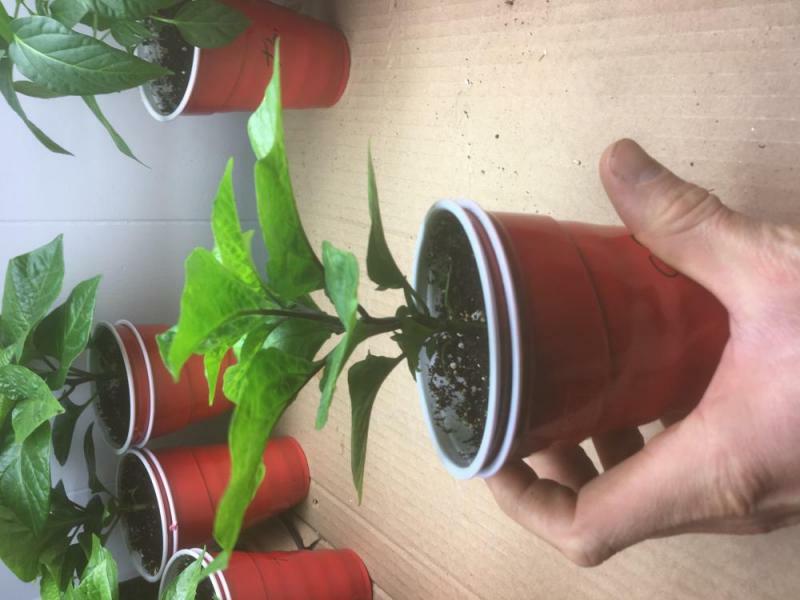 Those reapers are looking great! What kind of lights are you using? 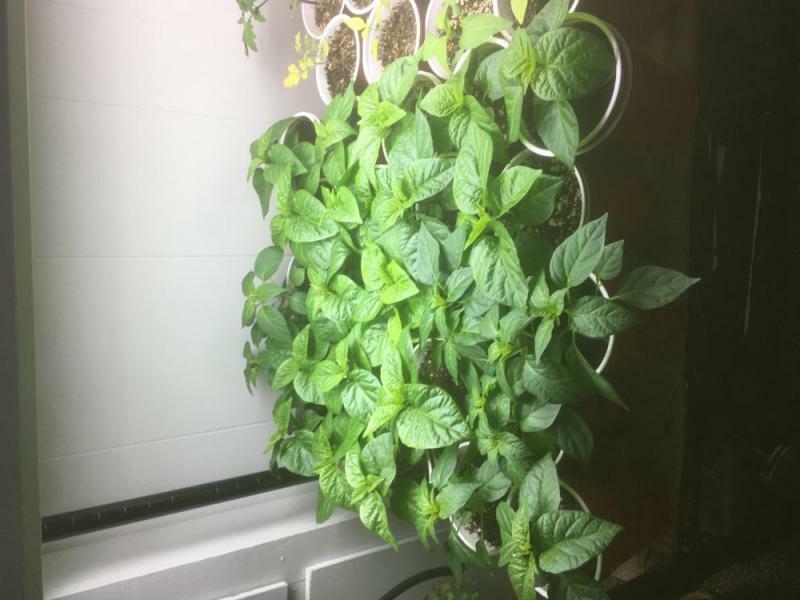 The lights are made by Vivosun, they are 4ft 4bulb T5HO's. The top one needs a new set screw/bolt on its wire hanger to level out the light, but that's not too hard to fix. We've been happy with them so far. To be honest, I'm not sure if we needed a 4 bulb light to get a bunch of seedlings started, but it looks like they might carry plants through to flower. Lots of the Thai's are trying to flower right now. 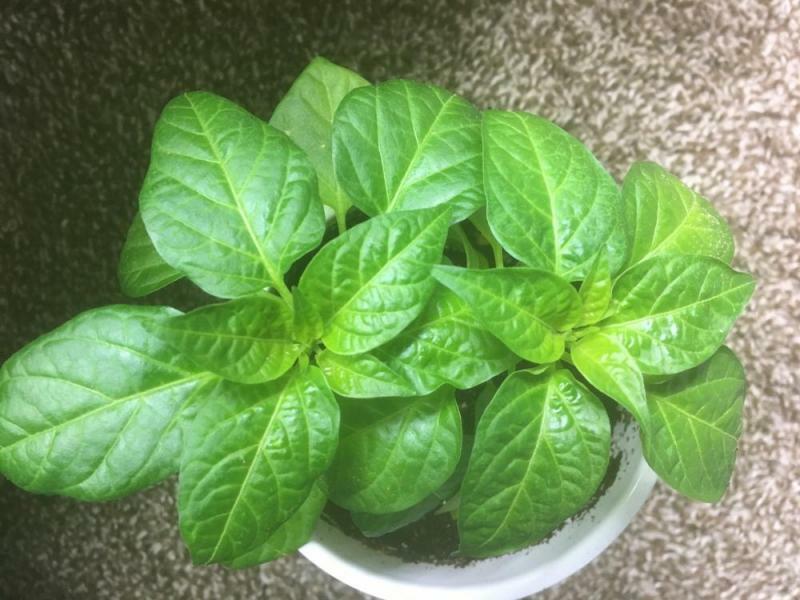 I hope to bring in some (2-4 plants) peppers for the winter, so these might be ideal. The one problem I see is that it you can't turn on/off sets of lights within the fixture. For example, if you only want to use 2 of the 4 bulbs, you have to physically remove 2 of the 4 bulbs. 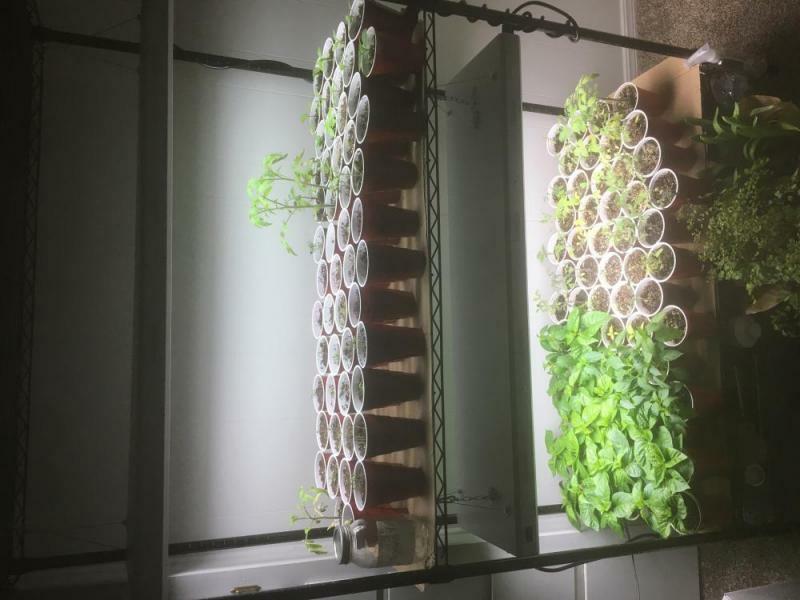 Here's an update on how things are growing. Things look to be going well. Some of the Thai Ornamental's are getting a few yellow leaves here and there (mostly old leaves) that are dropping off. I'm not too concerned though as there is a lot of new growth along the stems of the plants. 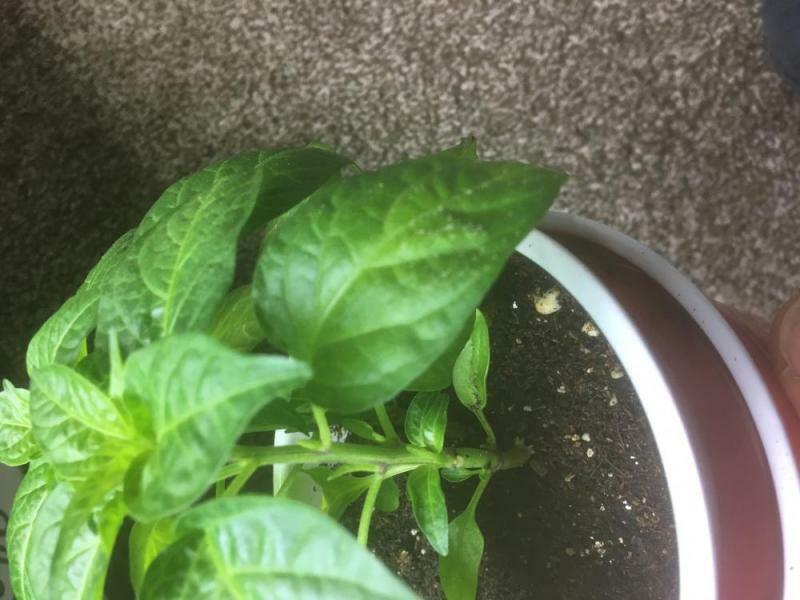 I've removed a bulb from the grow light that is over the peppers/tomatoes as the tomatoes seemed to not be liking the intensity. 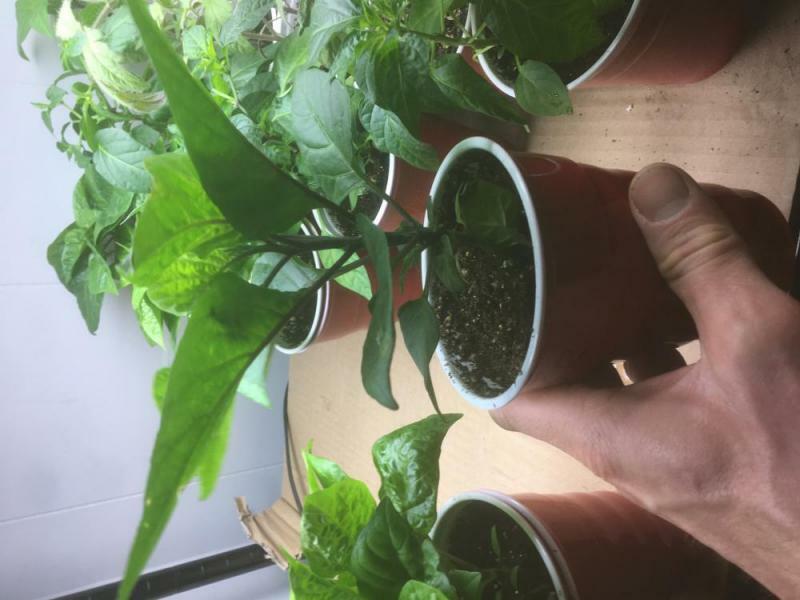 They were struggling but now are growing quickly and greening back up. Prior to this they looked a bit bleached out and slow growing. So, here's the photos. We are roughly 5 weeks out from emergence of the first seedlings if I remember correctly. 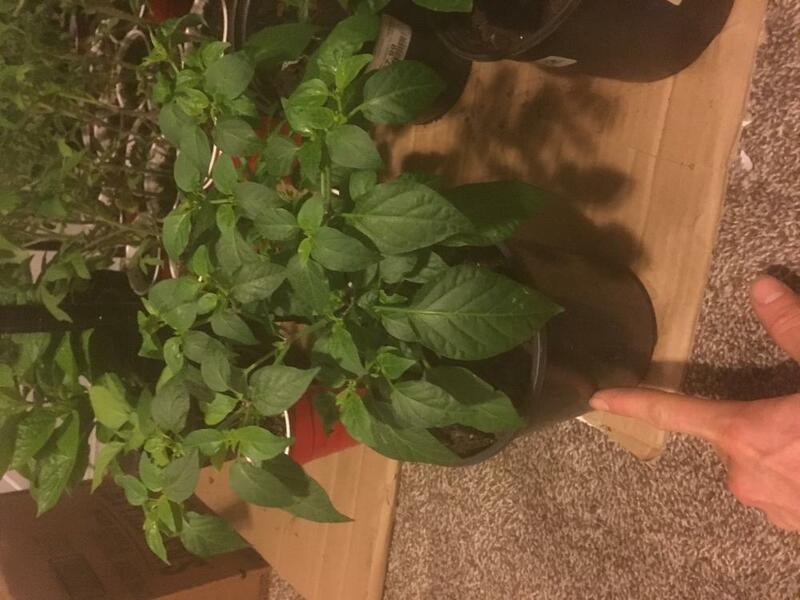 7Pot/Reaper, forgot to look which was which. Note the "reaching" leaves. Any idea what causes this? Crowding? Nutrients? I shouldn't be overwatering. 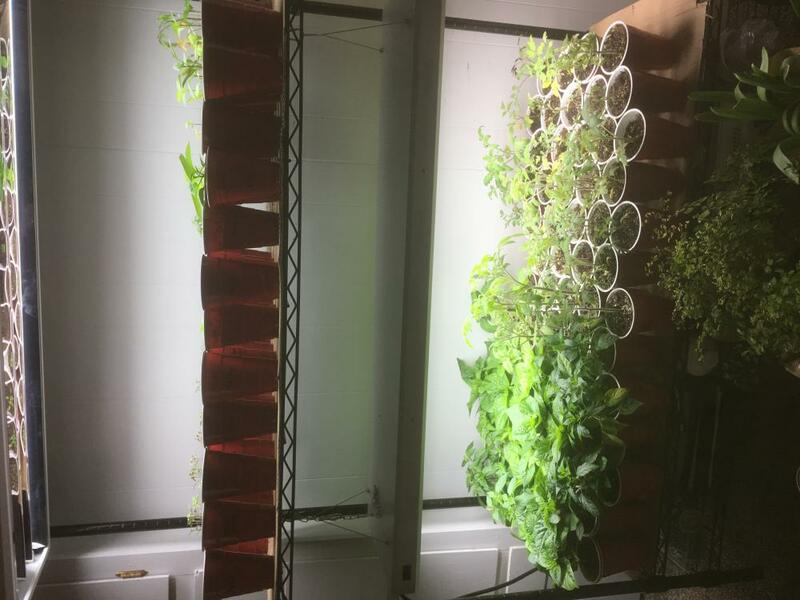 Any input on when to move up to bigger containers? I've got about 6 weeks before we can think of putting things in the ground. Some of the tomatoes look like they could use a new home but I've also seen some HUGE tomatoes in small pots from nurseries before that did well in the garden. I was thinking of hanging the lights from the cieling and putting all the plants on the floor. We lose the use of the "study" but that's the price we pay! hehe. The weather has turned, winter is losing its hold it seems. There's some snow in the mountains which is good, but it's almost all gone down low. I'll be in the garden soon, pulling some things that I didn't get around to before the weather went bad. Spring is finally here, kind of. We had a snow storm, but thankfully nothing stuck in the valleys. Temps have been in the 40's and most days have been sunny, outside of all the rain. We've started to help prep the garden plots and helped plant 500ish onions with the other gardeners. I've repotted a bunch of plants and will probably do some more this weekend. I've got a few more left to do, the Thai's seem hungry for space. The superhots are starting to throw out a few flowers but those are getting pinched off as they emerge. The Thai's put out a TON of flowers, pinching as many as I can. 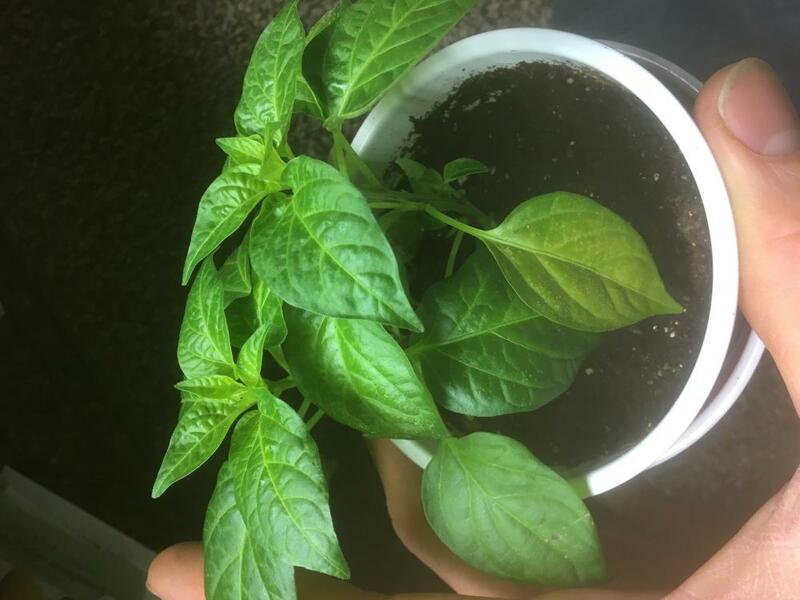 These plants are all about 2 months old (8 weeks) if I remember correctly. I have one question that I could use help with if you would like to chime in, else I'll just google/search. 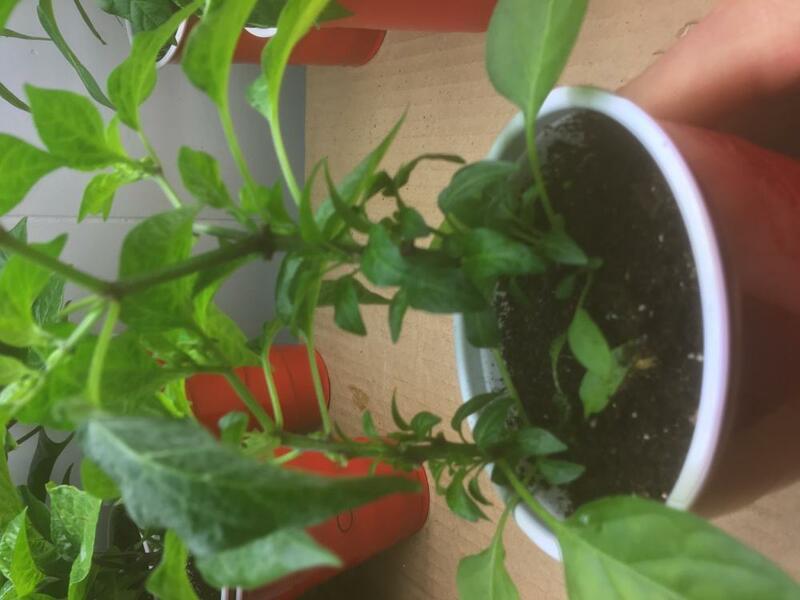 1) What causes the leaves to twist? This seems mostly confined to my Carolina Reapers. Have a great day everyone, we have a good 4-6 weeks to planting outside. We were also OK'd for an extra plot this year.